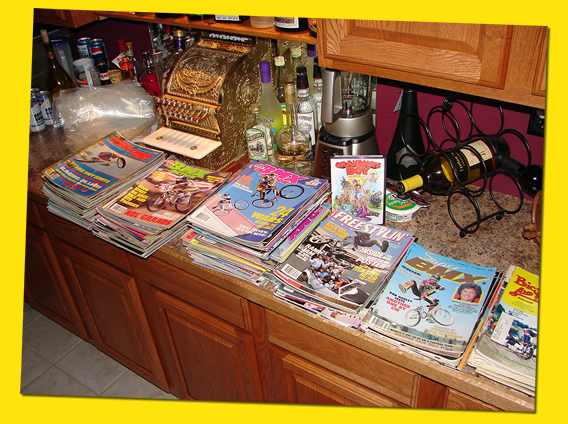 Below are some of the pictures and memorabilia I've organized into my BMX scrapbook. 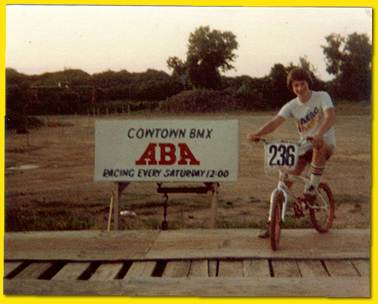 I raced ABA for several years and dabbled in freestyle as well. 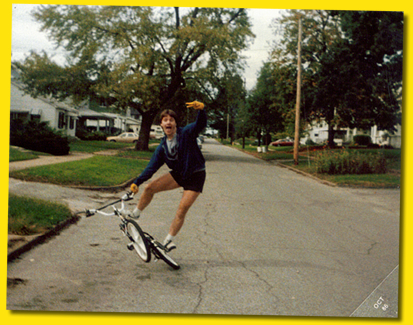 At first I worked part time at a bike shop called "The Cyclery", but quickly hired on at Bickel's Schwinn (1981) where I eventually spent most of my BMX time. 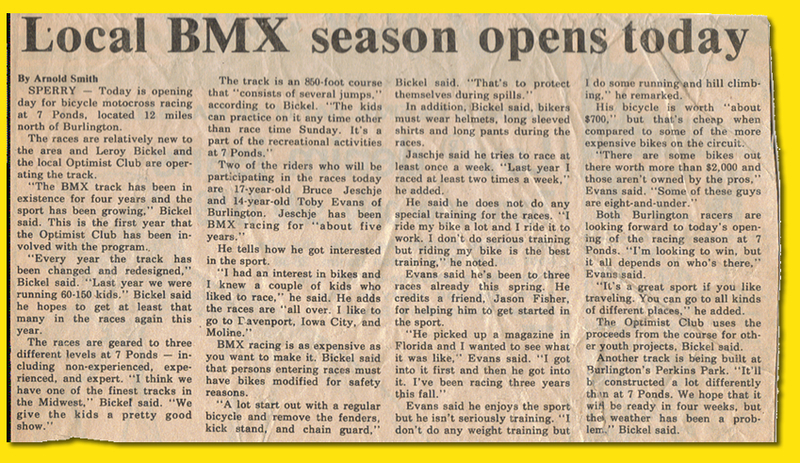 The period was 1980 - 1986, and reflects a lot of what was going in in the early/mid eighties in Burlington Iowa's BMX scene. 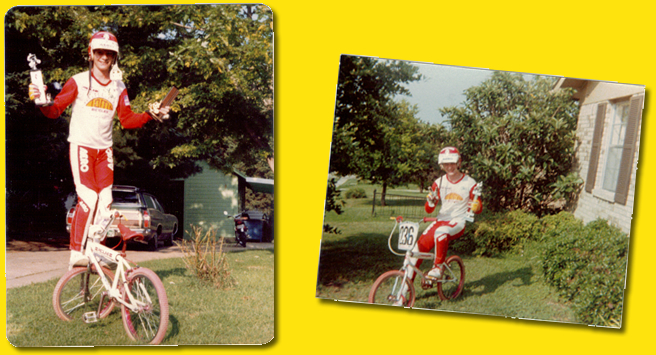 These are the first known "serious" BMX pictures I have. Note the "cool" Red Line jersey? How about the 4" thick white belt or the Velcro pant protector? One piece cranks, Skyway Tuff 1's and fluted seat post. I was 13 years old. 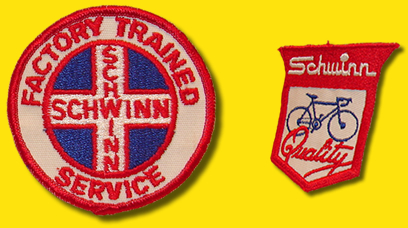 When I took the job at Bickel's Schwinn, it wasn't long before the owner decided to send a group of us through Schwinn Factory Training. It was kind of big deal, and at 14 is was my first "business trip". It was a week-long training that was scored and graded. We learned how to do basic bicycle assembly and repair, true wheels, adjust gears, build wheels, work on specialized bicycle components and much more. I was trained by the legendary "Mr. Foos" at the Chicago facility. The final tests were intense, but I ended up with Bickel's first perfect score. (Left) In 9th grade I took a photography class. We were supposed to find interesting subjects and capture profound images that caused an emotional response. So I took a picture of my bike. Hey...it was black and white, does that count? (Middle) Riding backwards is no big deal. But notice the arm brace on my left hand? 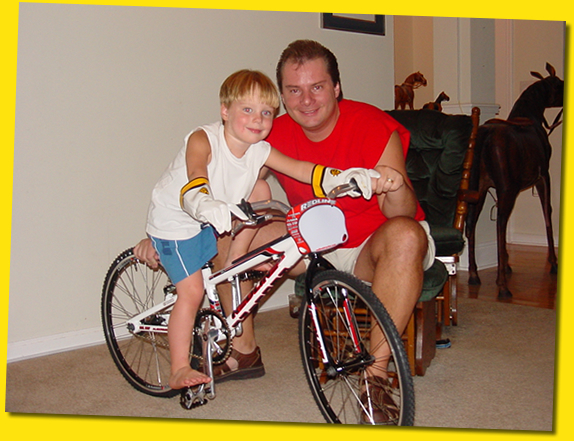 I had either a cast or arm splint on my left wrist for nearly 2 years. (Right) Look closely and you will see the tip of an old fighter jet wing in the pic. The airplane is on display in Crapo Park in Burlington, IA. And is much higher off the ground than you think. This was a drop off ride from the left wing. The big orange thing in my right pocket is a giant comb. I don't have much use for those anymore. 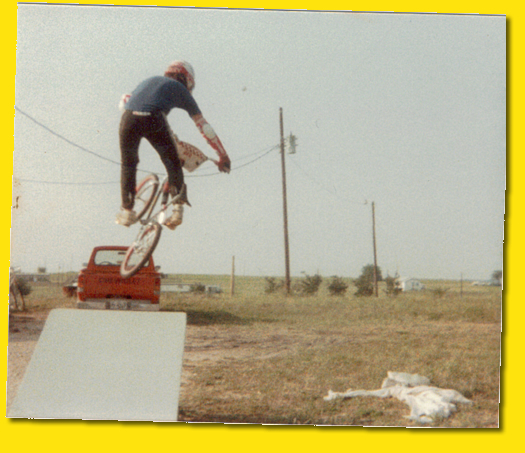 The local recreational area, 7 Ponds in Sperry Iowa, built a BMX track in early 1981. I remember going out there with my friend Brian Bowerbank and Brad Chenoweth to try out the track for the first time. The track was not done and it was lumpy. But we loved it and were so excited. That track was about to be sanctioned as an American Bicycle Association track. So I joined the ABA for the first time. Iowa-1 district #806. Some of the early races. 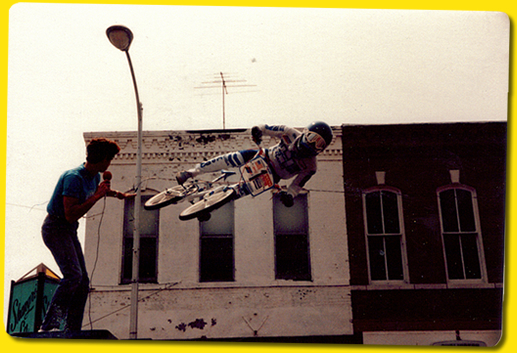 Iowa City BMX (left pic). Bruce Jeschke #806 and my friend Dave Carter #594. 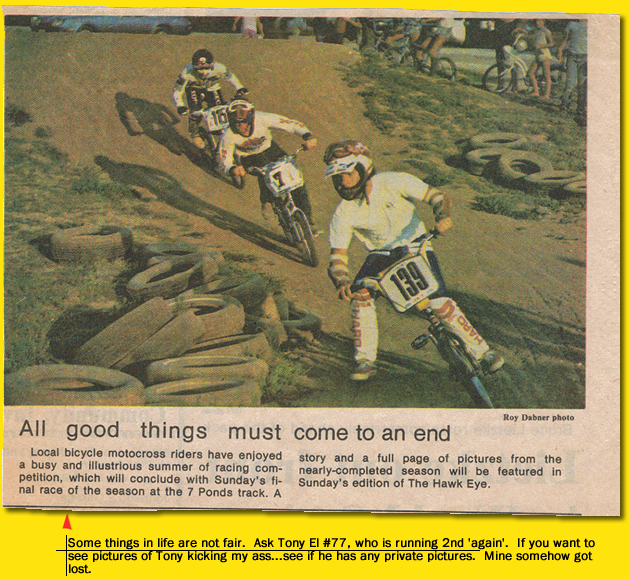 Then immediately after a moto; racing disapointment and exhaustion (right pic). Helmet by Ferragamo. Blue jeans by Sedgefield. Good thing I did not lose my wallet. 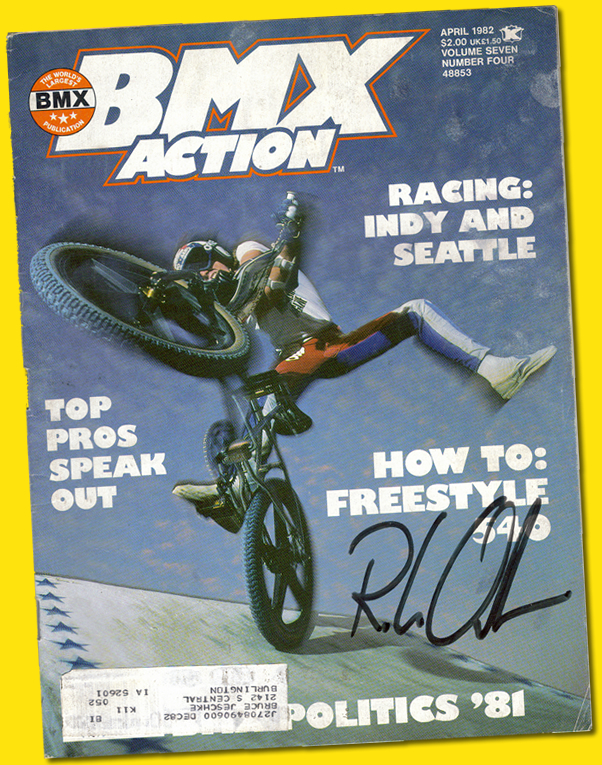 April 1982 BMXA signed by RL Osborn. The signature happened a couple years after the issue came out, at a show in Burlington, Iowa featuring RL Osborn and Mike Buff. This was a great summer. 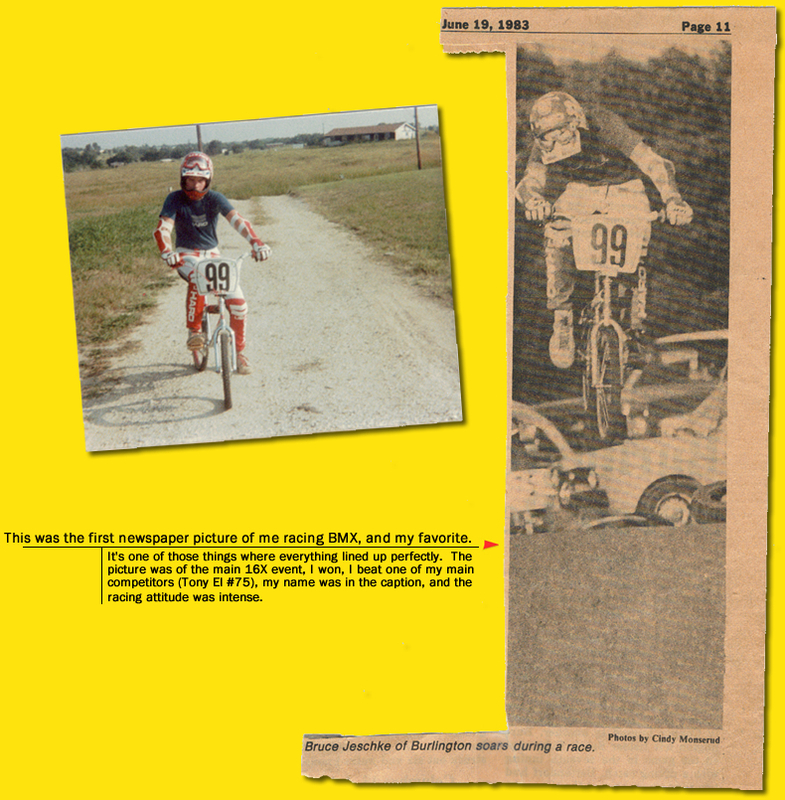 I turned expert on June 15th, 1982 in Ft. Worth Texas at Cowtown BMX. This here is what we call "Musical Motivation" compliments of Def Leppard and 1981. 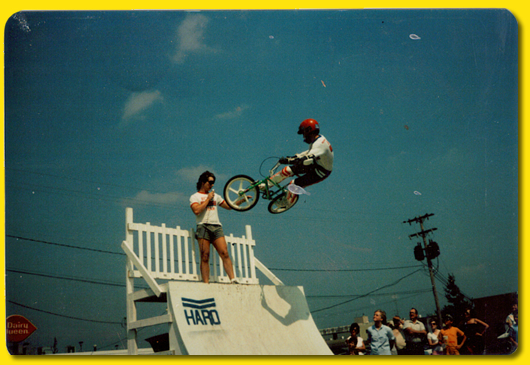 No posers allowed in BMX because "you can't get on stage for a contract clause". 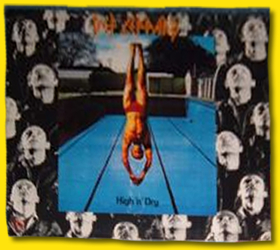 Trivia: Def Leppard drummer Rick Allen lost his arm driving what kind of car? 1984 Corvette. See the rest of my Corvette Site. The number 236 was my lucky number. 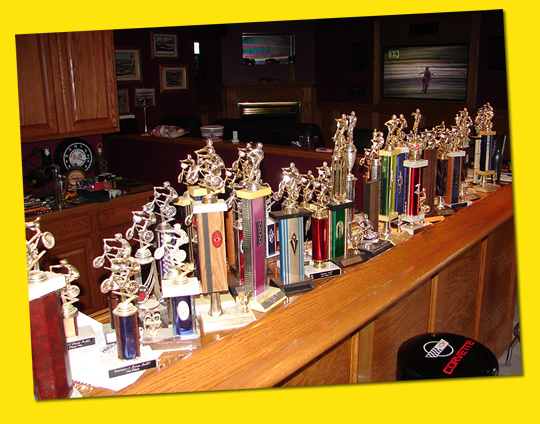 I won a lot of races, and had my eye on getting a double digit number plate for next year. Experts were fast, but I fit right in when I got back to Iowa. 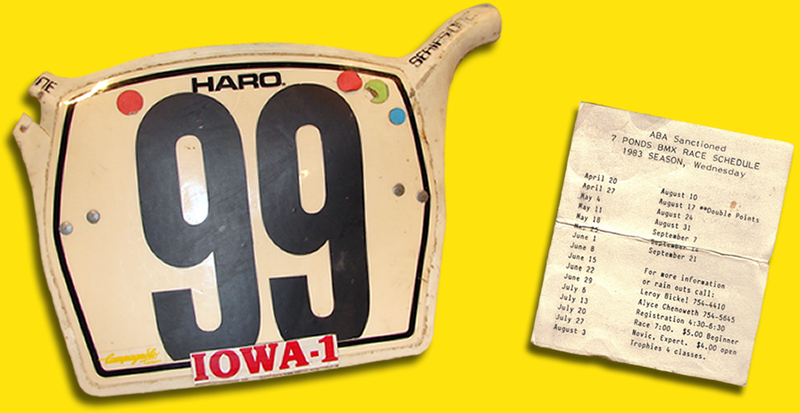 Moto Sheet from a 1982 race at Hawkeye BMX Raceway; a race that I won the 15 Expert class. I grabbed the sheet from the moto board as a keepsake. 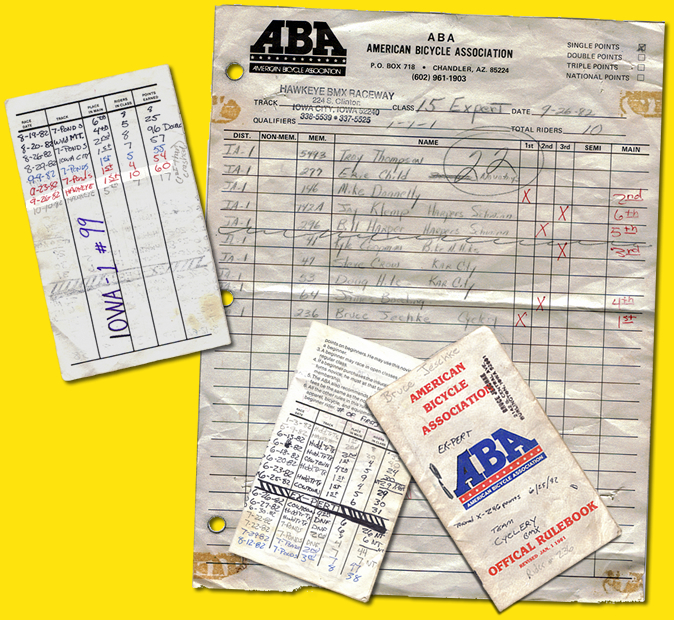 I also tracked all of my races, places, and points in my ABA rulebook. I'm trying to remember what hell the colored dots mean on the number plate. Oh yeah, bike inspections. Need to make sure you removed your kick stand and reflectors. Back in Texas for the summer, I set up a ramp for some pictures. Obviously I used my "jumpin' bike". Pretty lame. I spared you the pain of seeing the one where I'm jumping over a '10-speed'. Yep, "Jeschje" is not the first time they misspelled my name, but this one was really bad because I saw "Jeschje" and "Jaschje" all in the same article. I've been called worse things. Ok, Let's get this out of the way. Yes, this was my Senior Picture. I had a "sweater-vest only" version for school and year book, and "BMX-only" version because that's what I cared about most. This is the "dual version" that fuses both together. It's all pretty funny. But for the record? I do have 3 children now, which implies that eventually I got a woman to marry me. 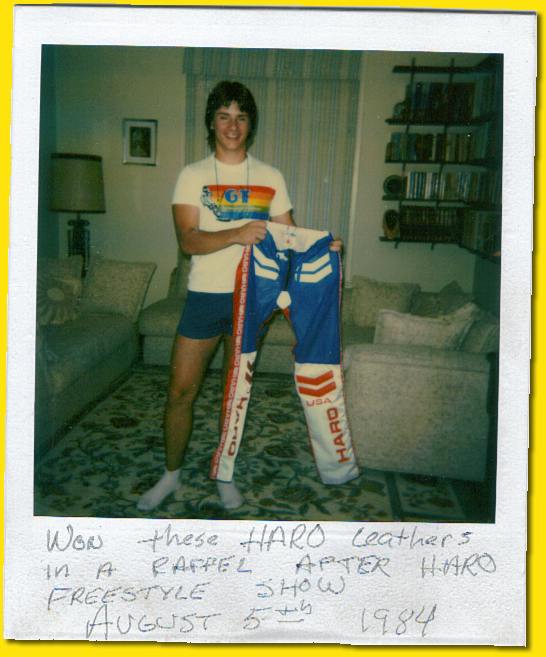 The picture says "Won these Haro leathers in a raffle after Haro freestyle show August 5th, 1984". Well...if I had spelled "raffle" right, that's what it says. I graduated from high school this year and worked at the Schwinn shop full-time as a BMX guy after graduation (sales, repairs, ordering, etc.). 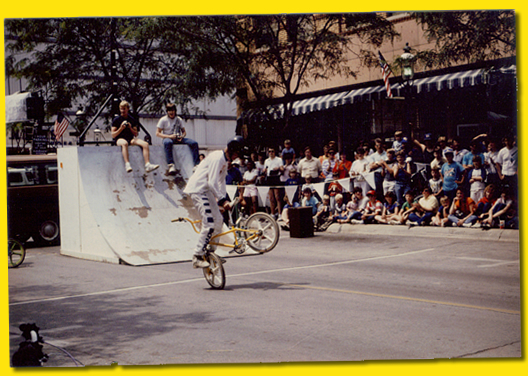 The hot emerging variation on the sport was freestyle BMX. I started to take interest in that, but spent the summer on the BMX Track. 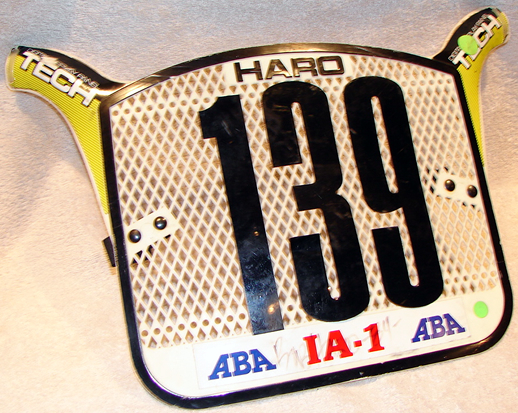 It's tough to see, but I had this number plate personally signed by Bob Haro. 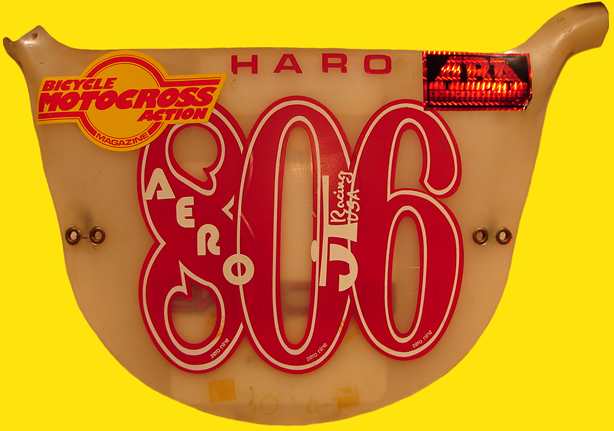 On the ABA banner sticker, you might be able to make out "Bob Haro -84-". Our 7-Ponds track was sponsored by the Optimist Club. 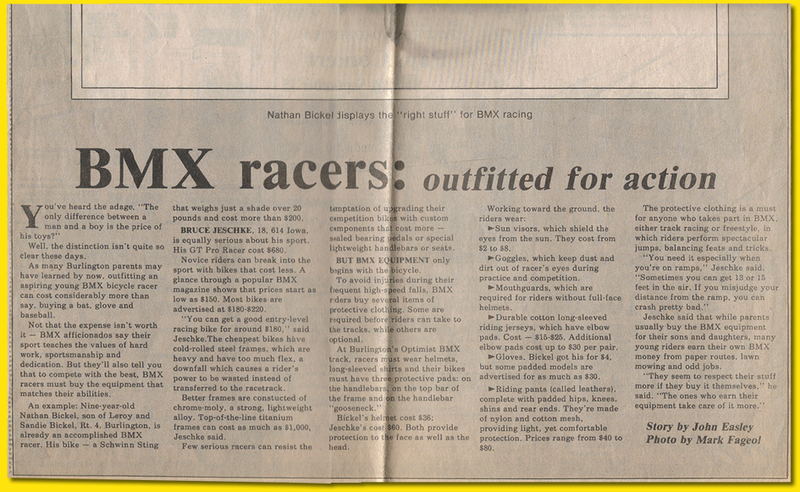 This is a story the National chapter did on our track, with an article picturing me #139 on the end of the starting gate. I thought this was a cool pic. Ok, I'm out of high school and have little idea on what to do with my life. So I stayed on full-time at the bike shop until deciding what to do next. 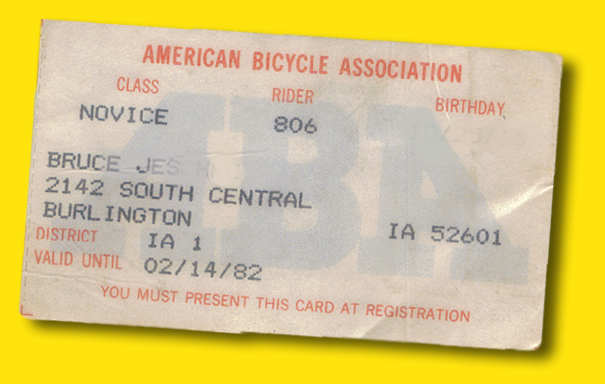 In 1984/1985 I got to do some neat things, such as attend the Chicago National Bike Show. 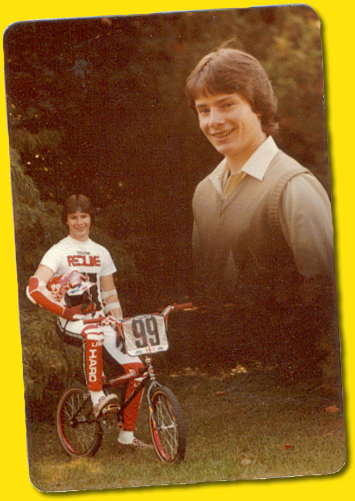 I ran into Rick Moliterno, a former 7-Ponds racing buddy from Davenport who was picked up by Factory Hutch Freestyle. I also met Scott Breithaupt from SE Racing, and Harry Leary and Eddie King from Diamond Back. 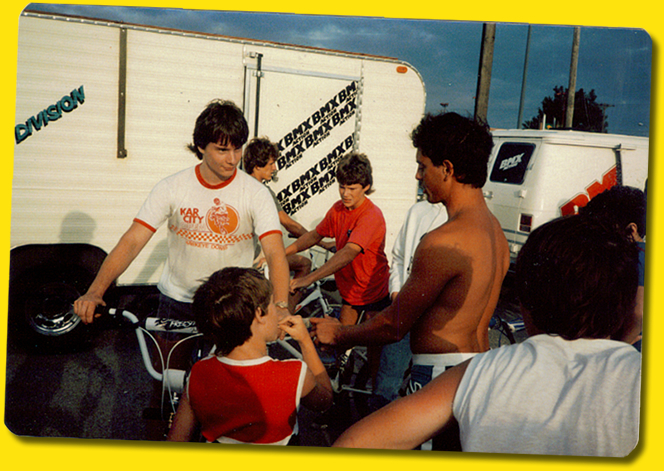 In this pic I'm on the bike, and the shirtless guy is Fred Blood. Factory sponsored by SE Racing. 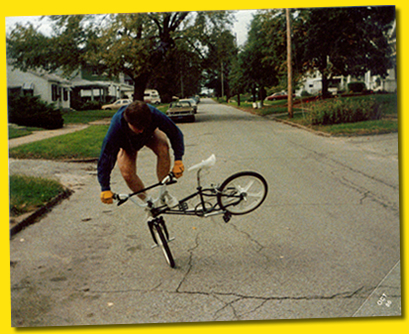 My freestyle bike was an SE Quadangle Freestyler. I have no idea who the kid is in the red shirt picking his nose. After seeing the BMXA trick team, 2-Hip trick team, and Bob Haro trick teams come to Burlington, freestyle started to take off. 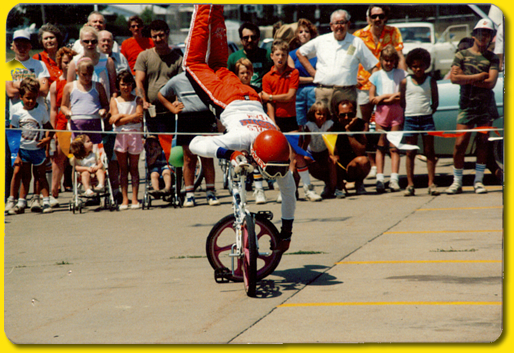 Bickel's Schwinn put together a trick team of our own. Our earlier shows were semi-gimped. But we learned a lot about freestyle from the touring teams and soon we had a pretty good production. Our music of choice for the big shows? 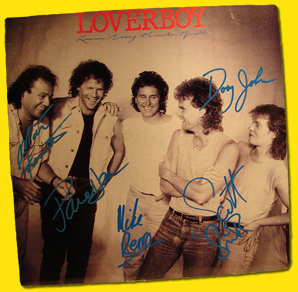 1986 Loverboy, 'Lovin' Every Minute of it.' Yes, I liked Loverboy. Yes, this album is signed by the band. (I think the original keyboard player got swept off his boat in the ocean and is dead now). 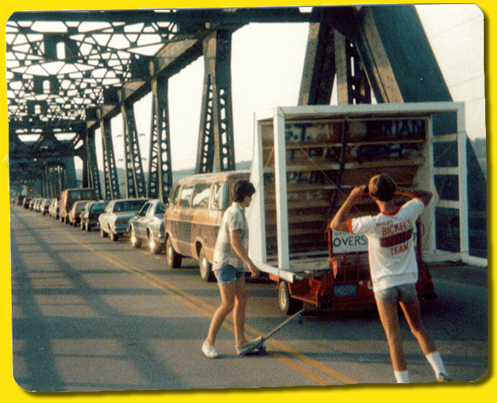 In the earlier shows we strapped our quarter pipe on a U-Haul trailer. That wasn't the safest way to go but it worked. Later we had the ramp made in to a custom trailer that we could "flip up" for a show, and "flip back down" again to pull it home. You can see the new one (above left) pic titled "Ben". "Daddy, why are all the boys in your biking pictures wearing their underpants?" I booked the shows, organized the gear, drove the van, did the set up, and MC'd the show and each routine. Plus I was the "older responsible guy" that made sure team team was doing what we were supposed to do. It got to be too much to ride my routine in addition to all that, so I dropped my performance and worked on the show production. 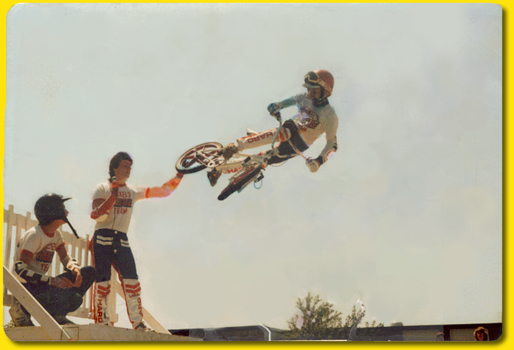 Besides, the younger guys like Jim (pictured) were better freestyle riders and more exciting to watch, so I didn't mind. The whole experience was a blast. I always got a kick out of somebody taking pictures of our shows and sending them to me or bringing them into the shop. That happened often, and in retrospect I'm really grateful that happened. 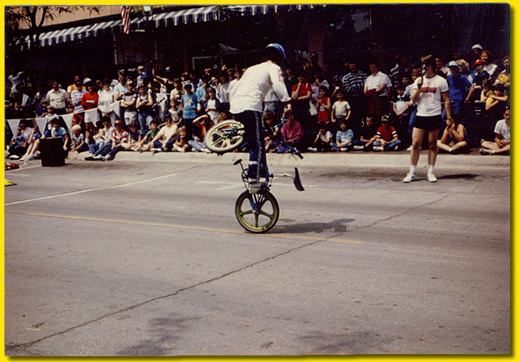 Brian Hester pulling off a "cherry picker" with "MC Bruce Jeschke" during a show for Steamboat Days. I quit the bike shop in the fall of 1986 to go to college. The pics above were taken the day I moved away for school. 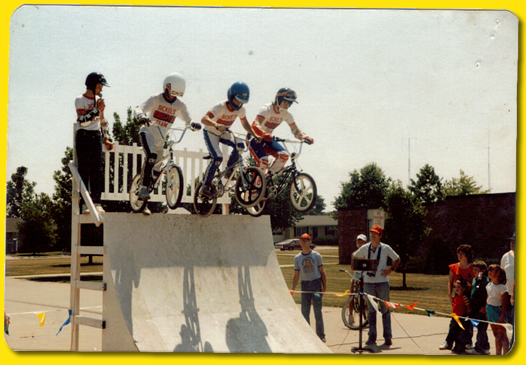 I loved my time with BMX and will never forget what the sport did for me. My 2005 cruiser project. A mixture of new tech and old school technology and style. Not a lot of BMX stuff made today is backwards compatible by 20 years. 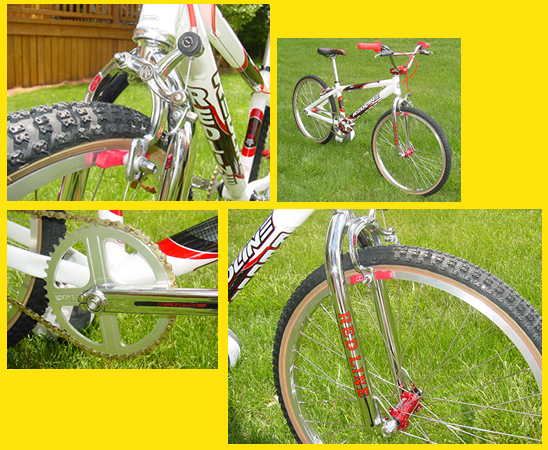 Old school stuff includes Tioga Comp III tires, Diacompe MX1000 front brakes, Oakley grips, Diacompe brake handles, Redline 42T 3/32 chain wheel, Suntour 16T 3/32 freewheel, and the gold plated Sedis Sport 3/32 chain which was my standard set up. Plus added are a lot of old school Red Line decals and style. For the new stuff, this beauty is built with absolute top of the line components. Red Line 24" aluminum frame and fork, all premium sealed bearings and new Red Line Flight Cranks. Bike also has Crupi titanium alloy pedals, Crupi stem, and Crupi titanium alloy sealed bearing hubs. 2007 De-Cluttering. Looky what I found. What? After sorting out the full BMXA years from 1981 - Aug 1986, I had about a hundred dupes and other non-BMXA mags that have been kicking aorund for 20 plus years. (I was a 'collector' even back then and didn't know it). Sold/Selling on ebay and finding a lot of really great BMX'ers out there.